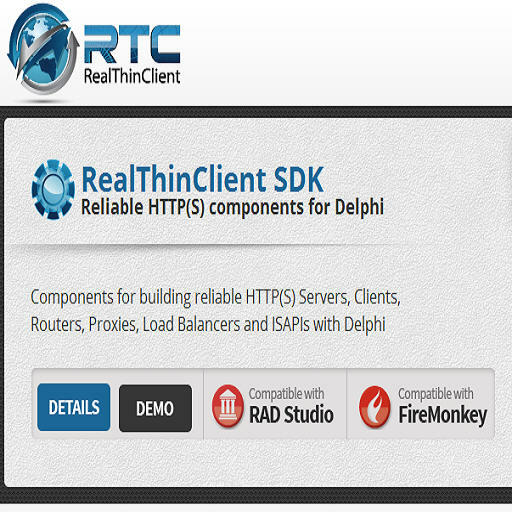 RTC (RealThinClient) is a reliable set of commercial HTTP(S) components (server / client) for Delphi applications, allowing developers to build rock-solid Internet ready applications with maximum flexibility for remote functions, sessions, and scripting. All the components are stress-tested and use non-blocking event-driven communication with a built-in thread-pooling mechanism. In addition, RTC supports all native and complex data types and provides the following features: RAD, multi-deployment, HTTP protocol, non-blocking, remote functions, strong encryption, automatic compression, a plug-in framework, and a small footprint. Most importantly, RTC is compatible with FireMonkey and supports Windows, Mac, iOS, and Android platforms..You can use RTC to build your own HTTP(S) servers, clients, routers, proxies, load balancers and ISAPIs. Download the RealThinClient trial edition and start building to today.